Michael Lee dropped a few more free agent names yesterday in Wizards Insider. I'm getting bored. 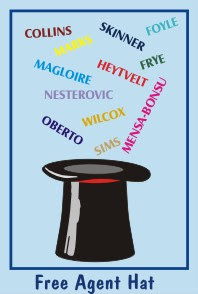 How about the Wizards just pick a name out of a hat. This player isn't gonna be a superstar or even get big minutes. Fabricio Oberto: Don't Cry For Me Argentina. Ring, Playoff Experience, Size, Plays Guitar...Sounds good to me! Brian Skinner: This guy would be great. Whenever he screws up we can all yell SKINNER! just like on the Simpsons. "And you call them steamed hams despite the fact that they are obviously grilled?" Adonal Foyle: Played for 12 years and in only 8 playoff games. Traded to Grizzlies who cut him after a month. I guess he has a ring with the Magic from last year, playing only 4 total minutes the entire playoffs. Will play for food, or whatever the veteran minimum is. Pops Mensah-Bonsu: Local college tournament guy. D-League All Star...eh that's a stretch. Courtney Sims: Triple Double in D-League with 11 blocks. Not much experience. Check how he does in Summer League with the Hornets. Josh Heytvelt: Wizards Summer League player. He would be a last last last ditch signing if all the other free agents would rather be unemployed than play in DC.